When we think of ticks, we think of insects that primarily affect dogs and cats. However, these are misconceptions in that; ticks are arachnids, not insects, and the different species of ticks found in North America mainly affect humans apart from pets. The reason why it is important to avoid tick infestations and tick bites is that they are proven to lead to several diseases like Rocky Mountain spotted fever, Lyme’s Disease as well as Ehrlichiosis in humans. In this guide we will study some effective ways of avoiding tick bites and infestations. The majority of tick infestations occur in the summer in heavily wooded areas and grassy trails. The nymphs and larvae of Deer ticks are active during spring and early summer while adults may remain active during winter and fall as well. Deer ticks climb on their human hosts through direct contact only; they do not fall or drop on them. Once they come in contact with humans, they crawl until they find a shaded protective spot. So, the best way to avoid tick infestations is to walk on less dense, non-wooded, less bushy and well travelled trails only. The best way to avoid tick bites is to wear long sleeved shirts, full pants, socks and shoes. Ticks also can be seen easily on lighter colored clothes. It is also a good idea to tuck the pants inside the sock cuffs and also tape open sleeves or loose ends so ticks cannot crawl inside them. One of the best insect repellents proven to effectively stop ticks in their tracks is DEET. You can buy DEET in the form of sprays, lotions or creams. 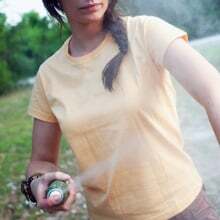 You can directly spray DEET on clothing and body while avoiding eyes and mouth. Never spray DEET based repellent on sunburns, rashes, or cuts. Also, DEET and permethrin pre-treated clothing and fabrics are also available in the market and can be worn on hikes or nature walks. (Most treated fabrics remain effective for up to 600 washes). Workers or hikers who spend time in tick infested areas must check each other frequently for ticks. They must avoid sitting down in areas having grass piles or leaf litter as this is a sure fire way of inviting ticks. Ticks can also come in contact with humans through one’s hair. It is best to keep long hair braided and tucked inside a scarf or a hat. Once you are home, dust the hair and shower immediately to remove hidden ticks if any. Once you are back after visiting heavily tick infested areas, toss all clothing in the dryer on its hottest setting for a minimum of 20 minutes. Also shower immediately to avoid tick bites from hidden ticks. Removing a tick that has attached itself to your skin requires skills and tools. Never remove an attached tick using your bare hands. Always use tweezers and/or a tissue paper to pull the tick out completely. Make sure the tick comes out completely and does not leave behind its mouth parts in the skin. Another effective way of removing a tick is using cellophane tape. The ends of the tape can be wrapped around the tick covered area and pulled out with the tick stuck to it. Tick bites must not be ignored. Make sure you wash the site of the bite with warm water and antibacterial soap solution. Also watch out for rashes, chills, fever, body aches etc. and if these signs are present, visit a doctor immediately. Lyme’s disease can be effectively treated and cured using antibiotics provided you seek treatment in its early stages. Delaying treatment can lead to permanent after-effects of the disease. Chronic conditions like joint and muscle aches have been reported in patients and they take years to improve. These are 10 effective ways to avoid tick bites and infestations. Share the knowledge!